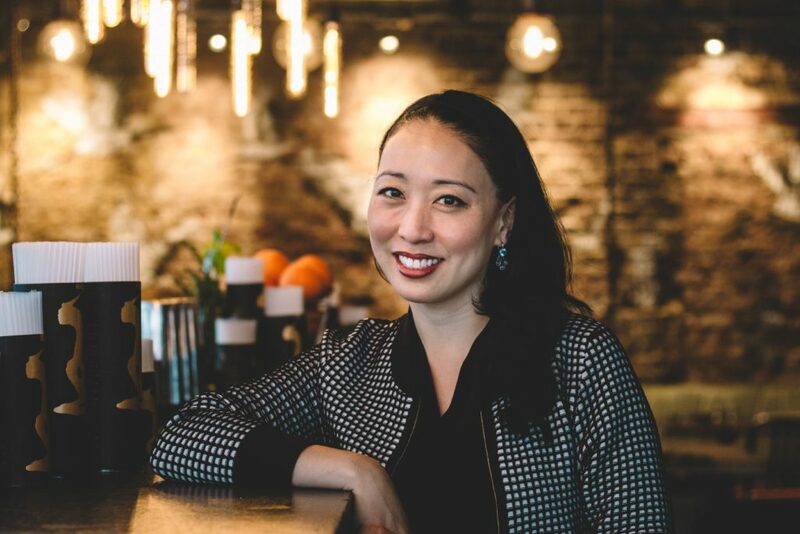 The jump from reading financials to reading recipes is quite a career switch, but it is one Judy Joo has embraced to the fullest and never looked back. After her formal training at the French Culinary Institute, Joo moved to London and worked the restaurant scene, opening her first restaurant, JinJuu, in 2015. 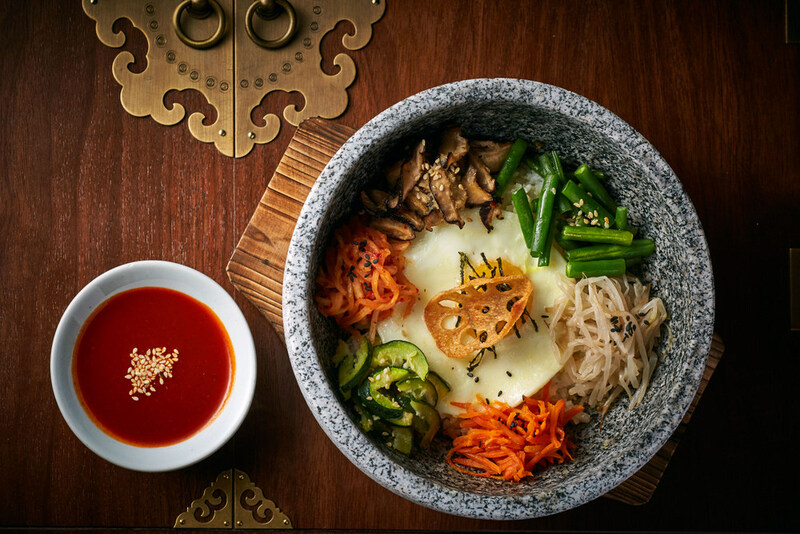 The restaurant focuses on traditional and contemporary cuisine, inspired by Joo’s Korean-American heritage, and was such a big hit that she subsequently opened a JinJuu in Hong Kong and then another in the Mayfair area of London. Joo can also be found as a regular on the Food Network UK, and as the host of ‘Korean Food Made Simple’ on the Cooking Channel. The Overhead Compartment split a few mandu dumplings with Judy Joo and learned about life juggling multiple restaurants and tv shows, while stealing a few recipes along the way. 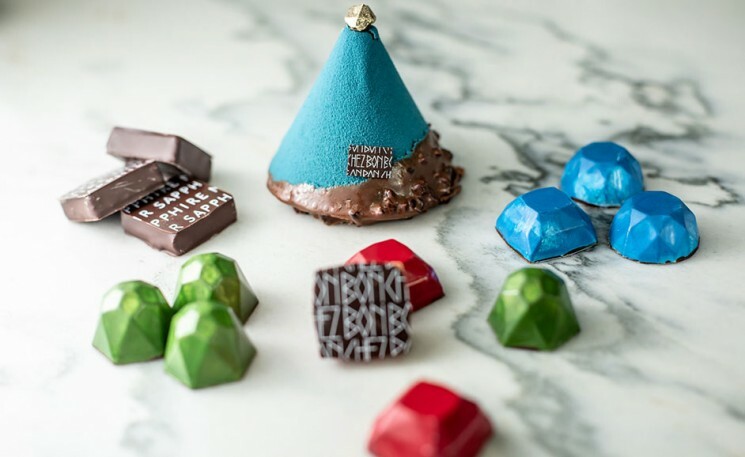 OC: You went to Columbia and graduated with an engineering degree, then after years in the financial world went to the French Culinary Institute and started your career as a chef. What made you decide to make the career change? JJ: As cliche as it sounds, I really did just have an epiphany and realize that life was too short to not do something that you loved. I was living my parent’s dream for me in a stable, responsible, high earning job on Wall Street… it wasn’t my passion or dream. So, after some soul searching, I took the plunge and just went for it; I quit my job and enrolled in cooking school. I admit, I never thought my culinary pursuits would lead to what I’m doing now. You never know where life will take you. It just demonstrates that you cannot plan life and you have to just see where it takes you. Follow your heart, seize opportunity and make your own luck. OC: Can you envision your life today if you had stayed that course? JJ: I do sometimes wonder about the “what if” scenario, and how different my life would be if I didn’t take this path in life. I would probably still be in banking, and making much more money! Or, alternatively I would have become a housewife with four kids, or something like that! Who knows. I don’t even know where I’ll be in the next five years…. I can say confidently, though that I am happier now than I would have ever been, if I stayed in finance. OC: What do you say to people today who are hesitant to follow their dream in that way for fear of failure? JJ: It is scary, and everyone is full of fear and apprehension. It is only natural to fear failure, as is extremely painful! But, failing is an integral part of success; I have more stories of grand failure than success. What sets you apart is how you deal with this fear, and transform that into courage and a formidable spirit. It is not easy and there were so many times that I felt like quitting. Being a minority female in three very male dominated arenas, engineering, trading floor, and kitchens, I have dealt with so many obstacles and still do. But, I keep on trying and as hard as it is, I have learned to embrace failure and frustration; it is part of the path. Surround yourself with positive people as well, and find good mentors. You will need support on your journey! OC: You appear on a number of Food Network and Cooking Channel shows, what’s your favorite part cooking on TV? JJ: I do love teaching people how to cook and, of course, I have a passion for spreading Korean flavors around the world. It is the simple things that I love the most— showing people how to change their usual summer bbq with a couple of Asian ingredients to make things exciting for their family and friends is really rewarding. Teaching people something new, whether it is a technique or a spice is really fun. I also know that as one of the few Asian American females on TV in the States, I am a role model to some extent. I realize that it is important to show the younger generation that you can follow your dream, no matter what your gender or race. I hope I am paving the way to make it easier for other female (and minority) chefs to succeed in this space. OC: What is the secret to staying balanced? JJ: I travel so much long haul (this month alone, I’m on 3 continents), so I’m chronically jet lagged and sometimes struggle to stay balanced. I am adamant though about carving out time for myself to rest, as sleep really is my 3rd pillar of health after diet and exercise. And luckily, I can sleep like a rockstar— and sometime pass out for 10 hours in one clip when I can (especially on long flights!). In terms of diet, I never drink alcohol on flights or when filming as a rule. I also don’t eat a lot of red meat and gravitate towards veggies and whole grains. I am a big believer of “biome” gut health too (eat kimchi! ), and inherently believe that food is medicine. People always ask me my secret to my clear skin relatively youthful looks for my age, and I really attribute it to my food choices and overall diet. Plus, I stay out of the sun and don’t smoke. I wear a fitbit and aim for at least 10K steps a day, and exercise (pilates and tennis) regularly. I come from a family of doctors, so health has always been paramount in my priorities. OC: You have a cookbook and multiple restaurants, what is one important lesson a person should learn to become a better cook? JJ: Educate your taste buds by trying as many different flavors and foods as possible. Cooking really is about learning how to taste and being able to find that delicate balance in dishes that all chefs strive for. Spice, acid, salt, and fat all play an important part in creating the perfect recipe. Then it is all about practicing and learning how to become and instinctive cook, and being able to identify what to add when a dish is missing something. Also, don’t be afraid to experiment— don’t follow recipes exactly, change it up and make it the way you like it! OC: You specialize in Korean food, what’s your favorite meal to cook? JJ: It sounds really strange, but I actually love cooking and eating tofu. I grew up eating tofu and in Asia, tofu is a food in its own right and not just a heart attack survivor’s punishment. My favorite dish is a classic Korean “stew” called “soon dubu jjigae”. It is a bubbling cauldron of silken tofu studded with gems of seafood swimming in a spicy fiery broth. With a side of steamed multigrain rice and kimchi, it’s my ultimate comfort food and the first thing I go for whenever I land in Seoul. It is also so easy to throw together; I start out with a deeply flavorful seaweed. mushroom and dried anchovy stock, which I kick up with a handful of Korean chili flakes, gochugaru. Fresh veggies, clams and clam juice add a great complexity to the stock and I like to thrown in some squid, shrimp and mussels as well. I will sometimes run to Chinatown, where I can buy fresh silken tofu still warm— so tasty! I throw the tofu in last, with a egg (sometimes two!) to make the soup a bit creamy. Just writing about it makes me want to eat some now! OC: How about to eat? JJ: Like a true Korean, I could eat kimchi, spicy fermented vegetables (usually cabbage), with every meal! It is Korea’s national dish and luckily a superfood as well full of probiotics, and completely addictive. I can add it to anything, literally! In mac and cheese, on top of burgers, in my eggs, as a side to Thanksgiving dinner! I have gotten so many of my Western friends addicted to it, and now they are even trying to make their own. Fermenting has become quite popular these days! OC: You founded “Harvest Time in Harlem”, what would you like people to know about that mission? JJ: This program was probably one of the most rewarding things that i have done in my life. This was Slow Food in Schools first inner city project in Harlem, NYC and the mission was in line with their ethos promoting garden to table eating and teaching children not only about making wise food choices and how to cook, but also where their food came from. We taught 3rd and 4th graders how to cook simple meals and encouraged them to try new foods. JJ: London: I really love Chantelle Nicholson’s restaurant these days, Treadwell’s, where she serves up great British food with a lot of veggie focused items too. She is focused a lot on vegetables, which I love, and even recently came out with a cookbook, Planted. Hong Kong: Every time I come here, I find a new place that I love. I am a big fan of what May Chow is doing here, and always grab a meal at Bao. This trip, I was lucky enough to go to Lamma Island where I ate at Rainbow Seafood Restaurant. It was so fresh and full of flavor— we had some of the best clams and squid that I have had in ages. OC: You have traveled all over the world opening restaurants and cooking, what’s the most exciting place work has taken you? JJ: Nevis: Every summer I do a mango festival in Nevis in the Caribbean, which I really look forward to. It is my 3rd year this July and I have really fallen in love with the island. I stay at the Four Seasons and do a number of events highlighting mangos— which is totally not a Korean ingredient, but we have made some really great dishes such as mango kimchi and mango infused Korean bbq. Nevis has so much local culture, history, wildlife, and many things to do, so I never get bored year after year. Last year, we saw sea turtles nesting and laying their eggs, and I got to see some local grandmothers make their famous island hot sauces. Filming in the corners of Korea: I have been to more places around the Korean peninsula then my relatives who have lived there their entire lives. I have seen small seaside fishing towns and islands, remote farm villages, hiked up mountains to visit monks and explored vast fields or mud flats to harvest everything from solar salt to cabbage to digging up mini octopus and clams. Coming up, I’ve got a mix of business and pleasure in Tel Aviv, Corsica, Capri, Avery Island, Los Angeles, San Francisco, Denver, NYC, Bordeaux, Paris, and India! OC: How would you spend a day there if you had one free? JJ: In Nevis: I am active beach holiday person and love water sports. At the Four Season’s there, I will always take out a catamaran sailing, go snorkeling, paddle boarding, etc. I’ll also play tennis and have found myself on the golf course as well! In the evening, I usually end up drinking Killer Bees and Sunshine’s on the beach and eating some fish tacos or goat water stew at one of the local beach huts. In Korea— I ALWAYS make time to go to the dermatologist and get everything lasered off my face and a deep medical facial! I am all about non-invasive treatments, and the beauty industry is so advanced in Seoul, plus it is so affordable. And, I stock up on the latest K-beauty products (another one of my secrets to great skin! ): snail mucin masks, ginseng serums, tiger grass creams, charcoal peels, etc. I’m not shy about throwing a mask on in flight either. Keeps your face plump and looking fresh when you deplane! JJ: I check out the quality of the bathrooms products they have and if there is anything super fun. I also like to see what snacks are in the mini bar. And, I don’t like any clutter, so i’ll usually put away all of the magazines that i’m not interested in drawers. JJ: Elizabeth Arden 8-hour cream. I have dry skin, and this stuff is more of an ointment and can be used anywhere. I mostly use it to keep my pout puckered up and moist as I always have chapped lips. Especially with the amount of time I spend in the air, I have to use something long lasting to combat that dry environment. I, also, often rub it on my hands and cuticles, elbows, anywhere that needs a bit of TLC. I buy it duty free in the airport in various sizes, and it is always in my bag; it works wonders! Judy Joo, please use care upon departure as items may have shifted in The Overhead Compartment during our journey. Thanks for choosing us for your travel tips! Have a wonderful day!